Arthur Ashe 10 July 1943 6 February 1993 American Arthur Ashe Sr. Mattie Cordell Cunningham Ashe Tennis player Tennis star of the 1960s and 70s and an African-American pioneer: the first black man to win at the U.S. Open and Wimbledon. He scored many other firsts in his career, including becoming the first African-American on the U.S. Davis Cup team in 1963. 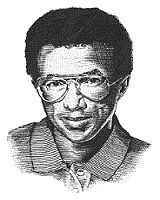 A list of popular arthur ashe quotes are given below.